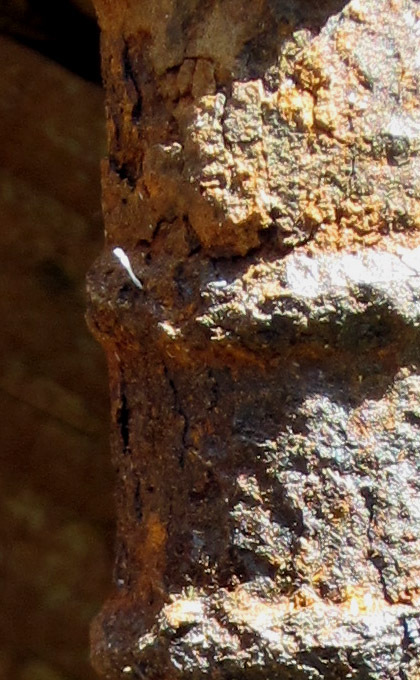 Yes, the above image is a rusting piece of reinforcing bar (aka re-bar), a material used a lot in building foundations. It adds strength and stability to the concrete. It’s something I feel is missing in life right now. The past few weeks have been very strange and unorganized, which isn’t good for my brain. I’m one of those people who like an organized schedule where things don’t shift too much. Sometimes I feel very boring and difficult to work with, especially during spontaneous situations. I probably drive my husband nuts on weekends because I have a hard time adjusting to his very unorganized patterns. Anyway, this week my husband had to travel to Boston for a few days, which upsets the dog population and household life. I also started physical therapy for an ongoing foot issue. PT will really kick in next week, alternating between different mornings, another thing to disrupt my brain path. Things are also wrapping up on the house sale. We were presented with two fix requests: water heater issue and roof leak by Monday morning. I’m glad the buyers are willing to be flexible with the due date. Supplies for the Camas project are still in route. Friday, I should finally receive 5# of Damar resin. I’m also scheduling bees wax pick-up that day or Saturday. The secret glue is still waiting for payment clearing before shipping. I’m glad the company is in California and should ship quickly next week. Oil bars are at Hester’s desk, waiting…. or at least I hope they are still there and she’s not passed them off to someone else! I have several people with paper ready to contribute. I just have to connect all the dots and I should be in business. Thursday I did a big push to clear part of my to-do list for work. I configured 205 image titles for an upcoming jury process, with another 5 yet to arrive. Not terribly exciting stuff, but I certainly appreciate when artists follow directions and tag their photos correctly. Otherwise I spent an awful lot of time renaming files. I was only working on the data sheet to accompany the images. The image file is yet to come. I hope that won’t take quite so long, plus I’ll be rewarded by viewing all the photos! Much better than lines of text! I’m also getting off easy with having a fairly small group of entries. I can’t yet imagine processing 100+ people! Brings back memories from working at Fall Festival. I think the only other thing to report on is my disappointment with having dropped off so many lanterns at the new shop in Salem. The shop is finally open, had a ribbon cutting and my work remains boxed up and not out for sale. In truth, the shop doesn’t seem able to accommodate additional work after examining photos from the opening party. Makes me want to yank my inventory and sell it someplace else. In my opinion, craft work requires a bit of space in order to appreciate the quality. When everything gets crammed together, the presence is lost. Where will my work be placed and will it even be safe with everything else around it? To remove or not to remove , that is the question! I’ll ponder that more next week. You have a lot on your plate right now. I can hear your difficulty not having a set schedule. Hang in there. My guess is that this time of your life is going to be this way for a while, but eventually things will settle out and get more predictable. Thinking of you. I hope things are going ok with your parents. Much love to all in Chi town! Such a lot going on! Hope things calm down a little soon. I’d pull the pieces out – not worth them being there if they’re not on display. I wrote to the shop owner last night. She has placed 3 in storage and won’t be able to access them for 2 weeks. I’m not thrilled, but happy she at least wrote back. Yesterday I got to visit the bee keeper and a dear friend. It was a lovely day! That’s a bit odd, taking them out of circulation for two weeks. Ho hum. The bees sound great. I had a bad feeling about the whole thing when I initially dropped work off. I felt very dissed by the owner, like I was a major inconvenience dropping off my work. Not a good way to start a business in my opinion.